You are currently browsing the tag archive for the ‘St Vincent’ tag. When I was a kid, they used to show a commercial on TV for Bounty, the coconut filled chocolate bar. The tag line was Een Stukje Paradijs op Aarde: a piece of paradise on earth. It showed a tropical beach with the bluest of waters, softly swaying palm trees and a coconut falling and breaking neatly in half to reveal the white cocos on the inside. It’s what I imagined a tropical paradise would look like, and in the Grenadines we found a real life version of it. After landing in Kingstown, the capital of St Vincent, the largest island in the group, we spent the Saturday roaming the busy market in the quaint little town. On Sunday, the streets were utterly abandoned, as people take their off-days quite seriously here, and we decided to head out the next day to one of the smaller islands in the Grenadines, which lie further to the south. 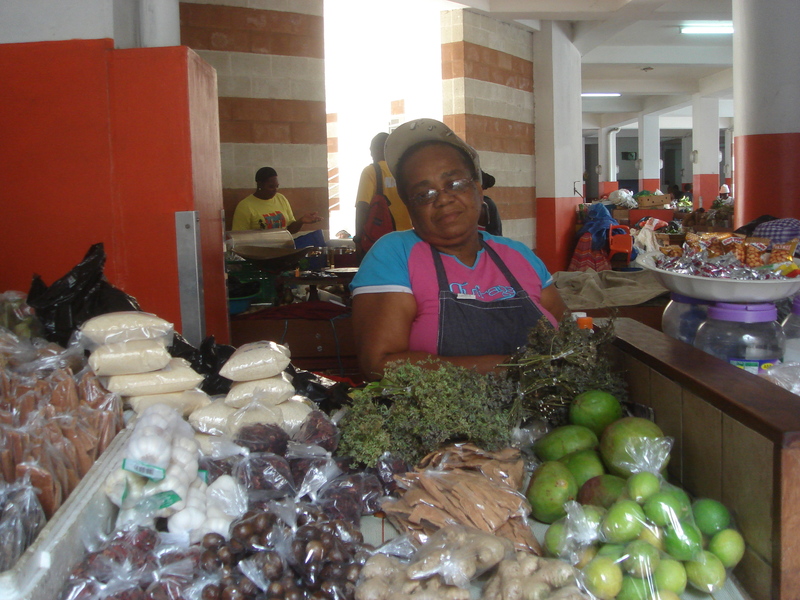 Vegetable and spice market in Kingstown. 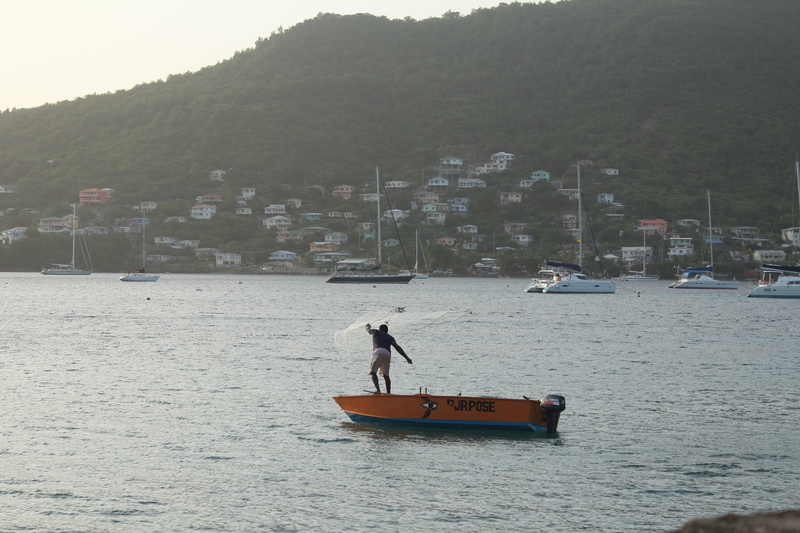 A cargo ferry took us for an hour across the choppy channel to island of Bequia. As we entered the bay, we saw dozens of sailing boats anchored in the shallow waters. The main village on the island occuppied a narrow strip along the sea and houses were dotted across the hillsides that rose up from the white stretches of beach. Since there are no major resorts on the island, the village felt much more alive than any of the other places we’d visited so far, in spite of it being the low season. A string of small bars and restaurants lined the waterside and a small walkway had been created that led past the lot of them. There was a nice beach at the end of the walkway, and two more a short watertaxi ride away. 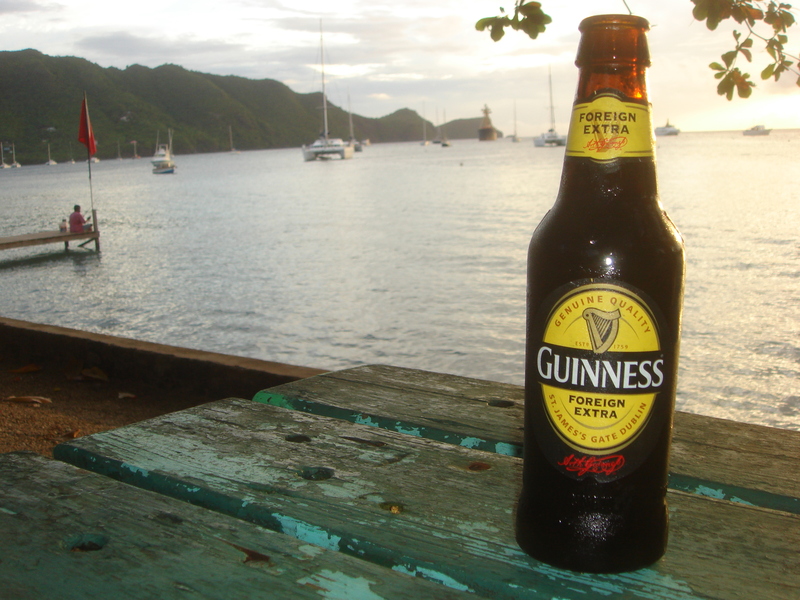 The Guinness is Good in Bequai, though a little strong at 7.5%. 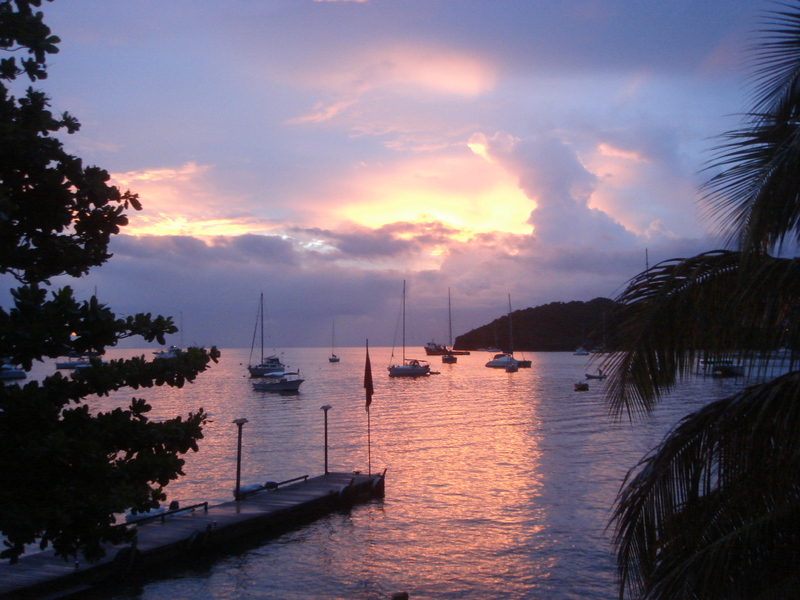 We stayed on Bequia for a week. Our routine was pretty simple: Wake up early in the morning for some breakfast and a swim. Have lunch and maybe visit one of the other beaches for more swimming and snorkling. Take a nap and go out in the evening for a cocktail or two and some dinner. Life was pretty hard out there. 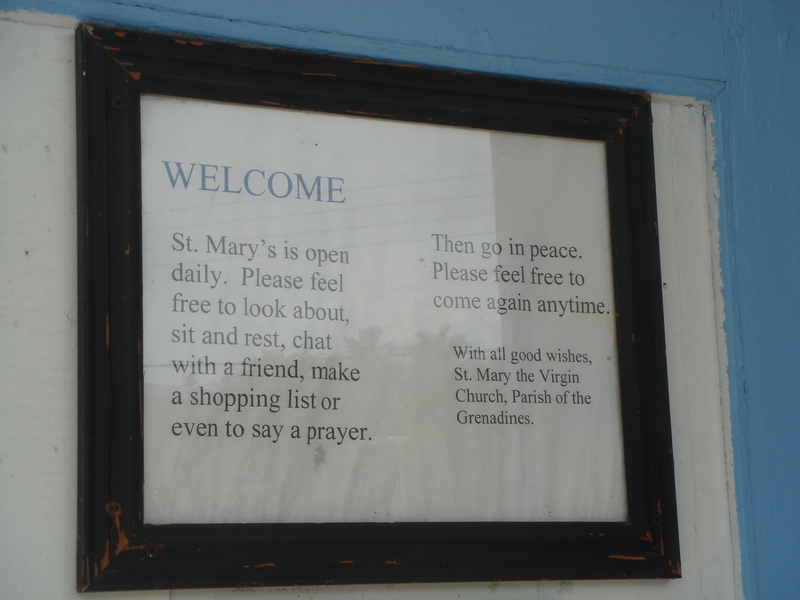 Even at the local church, they take things in a relaxed kinda way. As the island was so small, you soon got to meet many of the locals and we heard some of the stories. Even this far away from the business world, the impact of the recession was felt. Tourist numbers were down, a large cargo ship which was anchored on an enormous line and drifted across the bay had been put up for sale and left there for a year now, and a gorgeous hotel with many small bungalows was slowly collapsing in on itself as its owner had fled to France after apparently being hounded by the IRS for tax fraud. 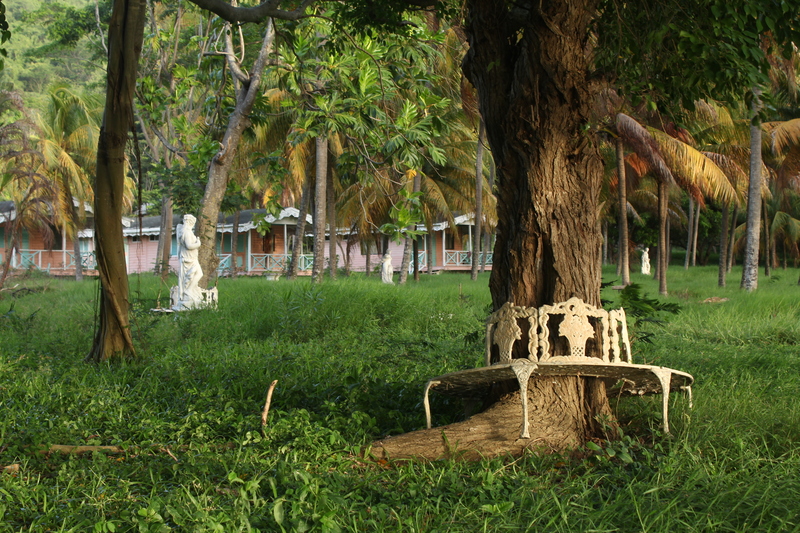 Garden of an abandoned hotel in Bequai. Nobody seemed too concerned by it all though. When the coconuts, mangoes and papayas still grow abundantly, and a cooling swim is a few meters away, you tend to worry a little less. Evening fishing for a portion of sardines.